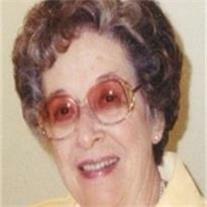 Florence Lambert Mecham, 87, of Gilbert, Arizona, passed away peacefully at home on September 4, 2012 of causes incident to age. The second of three children, she was born May 5, 1925, in Hanna, Duchesne County, Utah to Clyde and Martha May Rhoades Lambert. She graduated as valedictorian of Altamont High School in 1943 and also graduated from LDS Business College later that year. She married Evan Mecham in the Salt Lake LDS Temple on June 11, 1945. They settled in southern Arizona, where they were blessed with seven children. With Evan’s many church, business and political responsibilities, Florence dedicated herself to providing a loving and supportive home for the family. Although a private person by nature, Florence willingly supported her husband in his many endeavors, faithfully labored in many positions in the Church of Jesus Christ of Latter-day Saints, and provided an exemplary role model for all who knew her. After Evan’s election as governor, she served as Arizona’s first lady with dignity and grace. In her later years, she found great joy serving with Evan in the Mesa LDS Temple. She was preceded in death by her husband and her sister, Lucy Lambert Back. She is survived by her brother, Ray Lambert, of Salt Lake City, her children, Suzanne (Scott) Haycock of Glendale, Dennis (Linda) of Mesa, Christine (Tom) Marsh of Peoria, Eric (Bessie) of New Hampshire, Teresa (Greg) Allen of Mesa, Kyle (Lori Ann) of Mesa, Lance (Tawnya) of Phoenix, 29 grandchildren and eight great-grandchildren. Funeral services will be held Saturday, September 15th at 11AM in the Gilbert LDS meetinghouse at 4629 E. Guadalupe Road. A viewing will be held prior to the funeral from 9:30-10:30 AM. Interment will be in the National Memorial Cemetery of Arizona at 9 AM Monday. Funeral arrangements entrusted to Bunker’s Garden Chapel of Mesa. You and Evan Mecham were a terrific governor and first lady. The people of Arizona who voted for him know that and history will confirm it.